Damavand (5671 m) is the most prominent peak in Iran. It is The highest volcano in Asia and the fifth highest volcano in the volcanic seven summits (V7S). Climbing this respectable giant mountain is a life time memory. The experience of trekking to this summit is very rewarding. Before attempting Damawand mountain you should know all the necessary information for climbing. More in Damavand Frequently Asked Questions. Ascend to Damavand Summitin summer is not difficult technically but physically it is a difficult trek. The main challenge of the climb is Acclimatization because the air gets thinner with less oxygen as you go higher. To raise the chance of success and lower the risk of AMS and to enjoy a safe hike to the peak it is essential to get accustomed to this new environment. For a safe trek to any summit is essential to find the proper accomodation and use the safest campsites in the area. If you intend to attempt Damawand Mountain either from the classic south route or the west trail, the following campsites are the best places for Accomodation and settlement. Camp 1 Polour Resort in Polour Village as the first camp and the best starting point and Camp 3 Bargah New Hut as the high camp. Damavand is a perfect shape conical volcano, therefore climbing is possible from many sides. There are at least 16 known climbing routes to Mount Damawand summit. Four of these routes are popular because they have a shelter, refuge or a suitable campsite midway. The most favorite side is the south route because of its major settlement resort called high camp or the third camp Bargah Sevom New Hut. The best starting point for trekking Damavand Mountain is Camp 1 Polour. This mountain hut is the best place for accommodation and acclimatization in the area and the best starting point for climbing either from the south face or the west route of the mountain. Polour Resort is made by Iran Mountain Climbing Federation and it is administered by this organization. The second camp (or the base camp) of Mount Damawand is called Goosfand Sara (also called the Mosque). The Base Camp is located at altitude 3040 masl and it is the summer starting point of the south face. There is a small shelter, a mosque and a sheepfold in this campsite. Goosfand Sara is not a suitable place for camping and tenting in summer and the crowded climbing season because it is too crowded, very noisy and too dirty. The high camp (or the third camp) of Mt Damavand on the south trail is called Bargah Sevom. There are two safe havens and some tenting and camping places on this campsite at 4200 meters above the sea level. The Old Shelter, 4220 masl, is the oldest refuge and the New Hut, 4250 masl, is the newest mountain resort in the area. In general terms Mount Damavand has different Climates and seasons for hiking & trekking, climbing and ski touring. Mid June to mid September the weather is ideal for summer trekking, November to May the conditions becoming difficult for winter climbing and December to April suitable for ski mountaineering, snowboarding and snowshoeing. Climbing Damawand in Iran is a lifelong memory. Attempt to this 5671 meters giant volcano in summer is not technical and does not need major climbing skills but it requires a good physical fitness. The main challenge of this Ascend is acclimatization and the fact that the air gets thinner with less oxygen as you go higher towards Damavand peak. All foreigners who intend to climb Mt Damavand (and also Mt Alam Koh) in Iran either for trekking, mountaineering, ski touring or snowboarding, from any route and in any season, must obtain a climbing permit from Iran Mountain Climbing Federation in advance. The price of Damawand climbing permit is 50 USD per person. See also Permit. Damavand has sixteen known climbing routes with different difficulties. The most popular one for trekking is the south face which has very clear foot prints. The south trail has excellent mountain resorts at Polour Village 2200 masl and also a newly constructed midway campsite called Bargah Sevom New Hut at 4250 masl. Most mountaineers prefer to climb from the classic south route which is also the suggested climbing route for the beginners too. A reliable guide is highly recommended to increases the chance of success. Read more Climbing Routes. Trekking Damawand volcano is a life time memory. Before trying this mountain you should know the essential climbing information and Climbing Tips. Ascend should be done only in a correct timing and in a suitable weather, otherwise it is very tough and risky in a bad weather condition and off-season. A good physical fitness is essential. The main challenge is acclimatization; attempt the summit only after your body is well-acclimatised. The recommended climbing route is the south face. A reliable guide is helpful and will increases you chance of success. Best starting time from c3 to the top is 5 to 6 AM. Never climb at night. Use the day light only. There are some Common Mistakes in climbing Mount Damawand. These usual mistakes make real problem for the new climbers and even the experinced mountaineers to be unsuccessful in reaching the summit. By avoiding these frequent mistakes you will increase your chance of success to reach the peak. The most important mistakes are no or short acclimatization and consequently mountain sickness, climbing at night or in bad weather, insufficient equipment and information about the mountain, sleeping in crowded shelters and campsites, carring heavy equipment by yourself to the high camp. Damawand Mountain is well-known for its mild slops. Climbing this 18,605 feet giant volcano is technically easy but physically a tough challenge and requires a good physical fitness. The main challenge of ascend is acclimatization and the weather. Trekking in summer is comparable to Mount Kilimanjaro in Tanzania and Mount Everest Base Camp in terms of Difficulty. But winter climbing is a quite different story and may be compared to a 7000 m peak ot more. Damawand is a popular trekking target mainly because of its great height which is referred to as the tallest volcano in Asia and officially listed as one of the volcanic seven summits and the highest point in The Middle East region. Damavand Volcano attracts a great number of Iranian climbers and foreign mountain tourists especially in summer season and on its popular side the classic south route. This popularity makes some Crowd problem for mountaineers not only during the peak of summer climbing season but also for ski touring in winter. It is highly recommended to have an equipment check at the first camp and before you start your actual trek to the Damawand higher camps. Always have the essential equipments to protect you in case of bad weather condition. Depending to the weather forecast for the summit day, you may make a decision which gears are necessary to take up with you and which equipments are not necessary to leave behind at the lower campsites. Damawand height is 5671m, 18,605 ft. It is the highest peak in the Middle East and the highest volcano in Asia and the second highest in northen hemisphere. Ascend to this peak in summer is technically moderate but physically a tough challenge. In general terms you climb total 8 km trail distanc in 10 hours. That is 4700 meters from c2 to c3 in about 4 hours on the first trekking day and 3300 meters from c3 to the top in about 6 hours on the summit day. Gaining 2630 meters height from base to the peak in just 2-4 days. More detail in Facts and Statics. Before actually starting your program to Damawand Mountain in Iran it is a good idea to have a virtual trip by Google Earth and get an impression about the campsites, the best route and the trails, shelters, safe havens and mountain resorts in the area. Install GoogleEarth software on your computer or your smart phone and follow the tracks. If you want to explore Mount Damawand in Iran by yourself, GPS Track is the most useful guidance for your expedition. It displays the best possible trail and the suggested footprint. GPS track file is the most helpful tool for trekking Volcano Damavand in Iran. You can upload these files to your handheld gps device to show you the precise location and direction. Iran is wonderful country and the people are very helpful and will make tourists feel welcome. But there is some bad propaganda about travelling to Iran in the western media. Here you can read some comments and trip reports from mountain tourists who have visited Iran recently. The travel riports in Guestbook will help you to make your decision for travel to Iran either for sightseeing, climbing or ski touring Damavand Mountain. 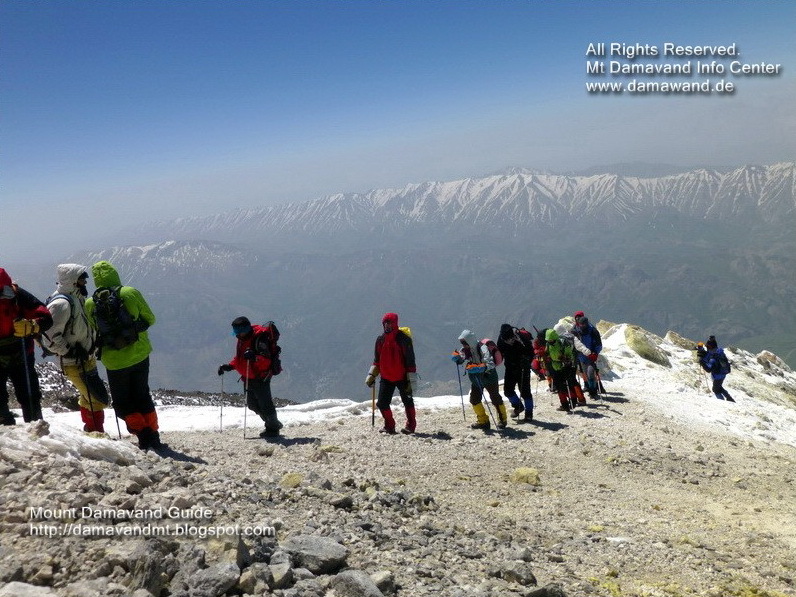 It is possible to climb to Damavand Peak with different itineraries. It mainly depends to your acclimatization, physical fitness and exercises to choose the right program. A Short itinerary is difficult and not recommended for everyone. To practice a brief itinerary you must be quite strong, well acclimatized and physically fit enough for a tough challenge. More detail How to Climb. The most favourite program for popular classic south route of Damavand is 5 days Itinerary. It has been experienced successfully many times in previous expeditions. It is the best relaxing itinerary for foreign climbers to increase the chance of success, comfort and safety. You may do some minor modification and changes to best suit your plan. It is a good idea to add an extra day to a package as a reserved day and make it more flexible for the second summit attempt in case of bad weather, more acclimation or being too tired to continue as planed. The only access to this mountain is the Haraz Road. You can travel by car to this mountain by road from Tehran to Polour mountain resort in Polour Village. The nearest international airport to the mountain is IKA International Airport Teheran, Iran. On the Haraz Road at the Polour Village Junction, there is a good sign, statue of a mountaineer which shows the correct location and the direction! Tehran> Haraz Road> Polour Village Junction> Camp 1 Polor. - What is your age and at what altitude do you live? - What kind of daily/weekly practice do you have? - Do you have any preparation and acclimatization for a 5000 meters summit? 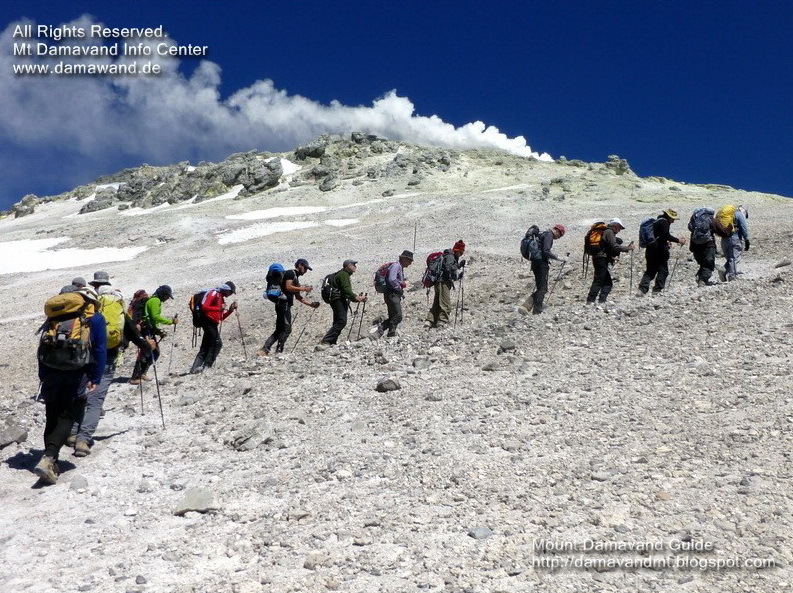 - What is your mountaineering experience and your physical fitness? - What is the highest summit you have climbed so far? The recommended starting day is Saturday. See also Crowd and Iran Holidays. Day 1: Transfer from a hotel in Tehran to Camp1 Polour. Day 2: Transfer to Camp2 Base and trek to Camp3 Bargah Sevom. Day 4: Climb to the Damawand Summit and descent back to the Camp3. Day 5: Descent to Camp2 and transfer to Camp1 and Tehran. Damawand Volcano is located in Larijan district in Mazandaran Province in northern Iran. It is standing on the south coast of the Caspian Sea in the middle of the Alborz Mountains about 80 Km North-East of the capital city Tehran. The coordinates and the GPS landmark of Mount Damavand south peak is: Latitude 35-57-19 N, Longitude 52-06-37 E.
In our websites you can find and download some useful road and route Maps for trekking Mount Damavand Iran. These helpful maps show you the entire track and footstep details and show you how to start from Tehran and go to the campsites and reach the Damawand peak. Best Timing to trek Damawand Mountain is mid June to mid September. In this season the south route ridge and the climbing footpath is usually free of snow. The weather is generally mild in summer and the access by 4WD vehicles to the base camp is possible. Remember in this period the Damavand resorts are crowded in Iranian weekends (Thursday and Friday). The beginners are strongly advised to attempt the mountain only in this climbing season. Damawand is a popular peak for trekking in summer. It is one of the most difficult peaks for Winter Climbing. Although it has mild climbing slopes but freezing temperature and strong winds makes ascend very difficult. South route is the best side for winter sports, other faces are more difficult. For a safe expedition you should be very experinced, physically very fit and well-equipped. You need a high skilled experienced guide. You need a good timing and good weather. You must be well-supported and be ready for any risk. Damavand is located near the Caspian Sea and it receives heavy snowfalls in autumn, winter and spring. The Winter Season may start from mid October and last to mid April. In winter condition the wind speed may reach upto 100km/h and the windchill temprature to -70°C. Beste Quelle für Informationen zum Wandern & amp; Trekking-Touren in den Iran Berge. Trek Damavand, geführte Bergtouren, Wanderungen zu Alborz Mountains. Skitouren-Expedition in den Iran Skigebieten. Organisieren eingehende Touren zum Bergsteigen im Iran. Bester Service und qualifizierte Führer für ausländische Teams und Einzelpersonen unterstützt. Maßgeschneiderte Bergtouren zu Alborz & amp; Zagros-Gebirge. Reiseführer und Bergführer Iran. Wandern Trekking, Bergsteigen und Klettern Damawand Touren. Outdoor-Reiseveranstalter in Iran. Führender Reiseveranstalter Mt Demawand und Öko-Aktivitäten. Elborz Bergtour / Skifahren. Sightseeing-Aktivitäten und Abenteuer-Urlaub Tour in Persien. Best source of info for hiking & trekking tours to Iran mountains. Trek Mount Damavand, guided mountain tours, hiking tours to Alborz Mountains. Ski touring expedition to Iran ski resorts. Organizing incoming tours for mountaineering in Iran. Best services and qualified guides to support foreign teams and individuals. Tailor made mountain tours to Alborz & Zagros Mountains. Travel guide and mountaineering guide Iran. Hiking trekking, mountaineering and climbing Damawand tours. Outdoor tour organizer in Iran. Leading tour operator Mt Demawand and eco activities. Elborz mountain trek/skiing. Sightseeing activities and adventure holiday tour in Persia. La mejor fuente de información para el senderismo & amp; excursiones de trekking a las montañas de Irán. Trek Monte Damavand, visitas guiadas por la montaña, rutas de excursiones a las montañas de Alborz. Ski expedición de gira a las estaciones de esquí Irán. Organizar visitas entrantes para el alpinismo en Irán. Los mejores servicios y guías calificados para apoyar a los equipos e individuos extranjeros. Tours a la medida de las montañas Alborz a & amp; Montañas Zagros. Guía de viaje y guía de montañismo Irán. Senderos de trekking, montañismo y escalada excursiones Damawand. Al aire libre organizador de viajes en Irán. Liderando turoperador Mt Demawand y actividades ecológicas. Caminata Elborz montaña / esquí. Actividades de turismo y viaje de vacaciones de aventura en Persia. Meilleure source d'informations pour la randonnée & amp; randonnées à la montagne Iran. Trek mont Damavand, visites guidées en montagne, randonnées à Alborz Mountains. Ski de randonnée expédition en Iran stations de ski. Organiser des visites entrantes pour l'alpinisme en Iran. Meilleurs services et guides qualifiés pour soutenir les équipes et les individus étrangers. Tailor made tours en montagne Alborz à & amp; Monts Zagros. Guide de Voyage et guide de montagne Iran. Randonnée pédestre randonnée, l'alpinisme et d'escalade Damawand. Organisateur de voyages extérieure en Iran. Premier voyagiste Mt Demawand et les activités écologiques. Trek montagne Elborz / de ski. Activités touristiques et visite aventure de vacances en Perse. Migliore fonte di informazioni per escursioni a piedi & amp; trekking alle montagne dell'Iran. Trek Monte Damavand, visite guidate in montagna, escursioni guidate a Alborz Mountains. Scialpinismo spedizione alle località sciistiche Iran. Organizzare tour in arrivo per l'alpinismo in Iran. Migliori servizi e guide qualificate per sostenere squadre straniere e gli individui. Su misura gite in montagna a Alborz & amp; Monti Zagros. Guida e guida alpina Iran. Escursione trekking, l'alpinismo e arrampicate Damawand. Tour Outdoor organizer in Iran. Tour operator leader Mt Demawand e attività eco. Elborz montagna trekking / sci. Attività turistiche e tour vacanze avventura in Persia. Beste kilde til informasjon for fotturer & amp; trekking turer til Iran fjell. Trek Mount Damavand, guidede fjellturer, fotturer til Alborz-fjellene. Skiturer ekspedisjon til Iran skisteder. Organisere innkommende turer for fjellklatring i Iran. Beste tjenester og kvalifiserte guider for å støtte utenlandske lag og enkeltpersoner. Skreddersydde fjellturer til Alborz & amp; Zagros. Travel guide og fjellklatring guide Iran. Fotturer trekking, fjellklatring og klatring Damawand turer. Utendørs tur arrangør i Iran. Ledende turoperatør Mt Demawand og miljøaktiviteter . Elborz fjelltur / ski. Sightseeing aktiviteter og eventyr ferie tur i Persia. Лучший источник информации для пеших прогулок и усилителя; пешеходные экскурсии в Иран горах. Trek Демавенд, горные экскурсии с гидами, походы в Эльбрус гор. Лыжные прогулки экспедиция в Иран горнолыжных курортов. Организация входящие туры для альпинизма в Иране. Лучшие услуги и квалифицированные гиды, чтобы поддержать иностранные команды и физических лиц. Индивидуальные горные туры в Эльбрус и усилителя; Загрос. Туристический путеводитель и альпинизм руководство Ирана. Туризм треккинг, альпинизм и скалолазание Damawand туры. Открытый организатор в Иране тур. Ведущий туроператор Mt Demawand и деятельности ОЭС. Elborz горы поход / лыжах. Достопримечательности деятельность и праздник приключения тур в Персии. Luchshiy istochnik informatsii dlya peshikh progulok i usilitelya ; peshekhodnyye ekskursii v Iran gorakh. Trek Demavend , gornyye ekskursii s gidami , pokhody v El'brus gor. Lyzhnyye progulki ekspeditsiya v Iran gornolyzhnykh kurortov. Organizatsiya vkhodyashchiye tury dlya al'pinizma v Irane. Luchshiye uslugi i kvalifitsirovannyye gidy , chtoby podderzhat' inostrannyye komandy i fizicheskikh lits. Individual'nyye gornyye tury v El'brus i usilitelya ; Zagros . Turisticheskiy putevoditel' i al'pinizm rukovodstvo Irana . Turizm trekking , al'pinizm i skalolazaniye Damawand tury . Otkrytyy organizator v Irane tur . Vedushchiy turoperator Mt Demawand i deyatel'nosti OES . Elborz gory pokhod / lyzhakh. Dostoprimechatel'nosti deyatel'nost' i prazdnik priklyucheniya tur v Persii .